It shouldn’t have surprised any of us that one of the new comics for The New 52 that was in the “Green Lantern Family” wasn’t actually about any Green Lanterns but instead focused on an entirely different corps. 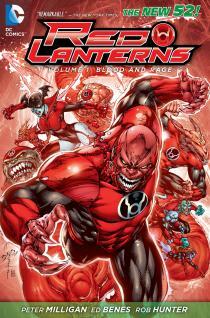 The Red Lanterns are probably the best of the nine corps to carry their own book (excluding the Green Lanterns and Sinestro Corps) and there is a lot of potential in this book, but it doesn’t ever fully capitalize on it until it’s closing chapters. Pete Milligan writes the book and he takes it down a direction that you wouldn’t necessarily expect from a comic about vengeful space aliens. Instead of a totally nuts action space adventure the story has a very personal touch to it and functions as a large character piece instead of an epic action tale. This style of storytelling is an interesting choice considering the background of the Red Lanterns and their leader Atrocitus. The nature of the character is still how he was in Blackest Night and other tales, but he is a much more meditative and self-loathsome character. Though I found this departure to be a different style of telling this story, many others will find it very boring when they read the book. I like the basic premise of the story, that Atrocitus is fueled by the rage of the universe and it drives him to right many wrongs, but sometimes it just doesn’t deliver. The book is rather repetitive even within the same issues and the thing that gets really old about the writing is how each issue feels like a “jumping on point.” Yeah it probably works in the single issue format, but as a trade it is tiresome, especially when you read it in one sitting. Once you get to the final two issues though the story starts to get interesting and much more original than the rest of the book. It will be frustrating for many readers, because it just happens to end in the middle of the best part of the comic. Ed Benes’ art is quite good. He draws vast landscapes very well so any time a new planet shows up (which is often for a space book) it looks great. His action sequences are also very well defined and easy to navigate, which is one of my biggest criteria for enjoying a comic’s art. His character designs are also great with not a single member of the corps looking like another. I wanted to like this book a lot, and I do for the most part, but there is something within that is pretty upsetting on further examination. I realize that the character of Atrocitus is a violent guy and doesn’t think twice about being intrusive or destructive towards anything in his path; however, when the book has him relentlessly beating a female character without much cause and shouting things at her like “OBEY ME WOMAN!” I start to smell the stench of sexism. This book is only for those really interested or Lantern enthusiasts.